Glenelg has received a massive midfield boost for its encounter with Sturt on Good Friday. Star on-ballers Luke Partington (hamstring) and Matthew Snook (groins) have been named in the 23-man squad after overcoming recent ailments. Partington has missed the Bays’ past two matches while Snook is yet to feature at League level after building fitness in the Reserves, culminating in him registering 32 disposals and 10 clearances last round. Forgotten forward Tim Sumner has been named on the extended interchange bench after kicking two goals in the Reserves while Declan Carmody (18, 177cm and 74kg) could be another RAA Rookie for the Tigers if he isn’t trimmed from the squad. High-flying forward Josh Scott will miss 6 weeks after breaking his arm in a marking contest against the Panthers last Saturday while Will Gould has been called up for AFL Academy duty. Bailey, Boyle, Carnelly, Carney, Davis, DiSotto, Emmett, Feely, Holyoak, Jones, Kerrish, Leck, Lovelock, Martini, McDermott, Potter, Searle, Thompson, Virgin, Yates. 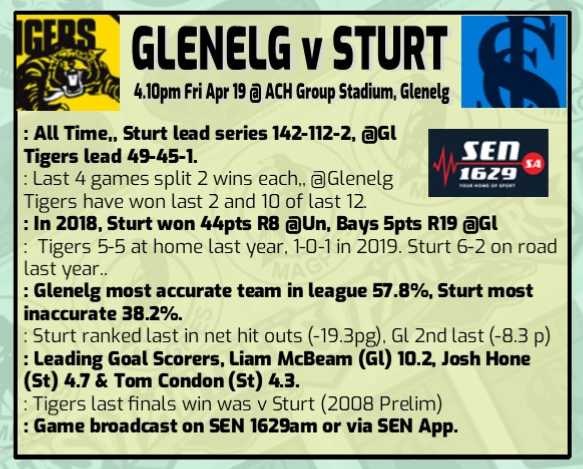 Sturt will be without some premiership tall timber for its Good Friday blockbuster against Glenelg. Ruck/forward Tom Read (calf) and key defender Rune Gilfoy (shoulder) weren’t deemed fit to face the Tigers at ACH Group Stadium. Their absence will ensure the debut of RAA Rookie Will Coomblas (20, 188cm and 85kg), who is originally from the Unley Mercedes Jets. Coomblas will replace Gilfoy at full back while promising bigman Hugo Munn has been named on the extended interchange bench in Read’s absence. Premiership forward John Greenslade has recovered from a groin strain while Adam Trenorden is continuing to push his claims for a League debut after racking up 35 disposals and a goal in the Reserves last round. M. Lochowiak, T. Hone, Samblich, Penfold, Shute, Wildman, Voss, Grivell, Illman, Wills, Fahey-Sparks, Allan, Richards, Coombe, Clifford, Thornton, Thiele, McEntee, Armiento, Burrows, Edmonds.